Back in November, I purchased a lovely little project bag covered in sheep for my mums Christmas gift. I got it from a lovely lady on Etsy called Josiane who’s Etsy store is called GladeOfDreams. As a thank you for my first purchase she gave me a discount code for my next purchase. Well, mum loved hers so I decided that for chris’ Birthday, I would get him his own one. Up until this point he has been using one of the organza bags provided by Wool Warehouse but organza doesn’t hold up well to dpn’s. So I thought it time he had an upgrade. And of course, it would be daft of me not to get my own project bag too, wouldn’t it? So I got this one. And, the parcel came with an added extra – she had thrown in an extra little notions case as a thank you for being the first buyer of 2019. Isn’t that lovely? and its the perfect size to fit in my stitch marker tin, my chibi, and my jammy dodger tape measure. 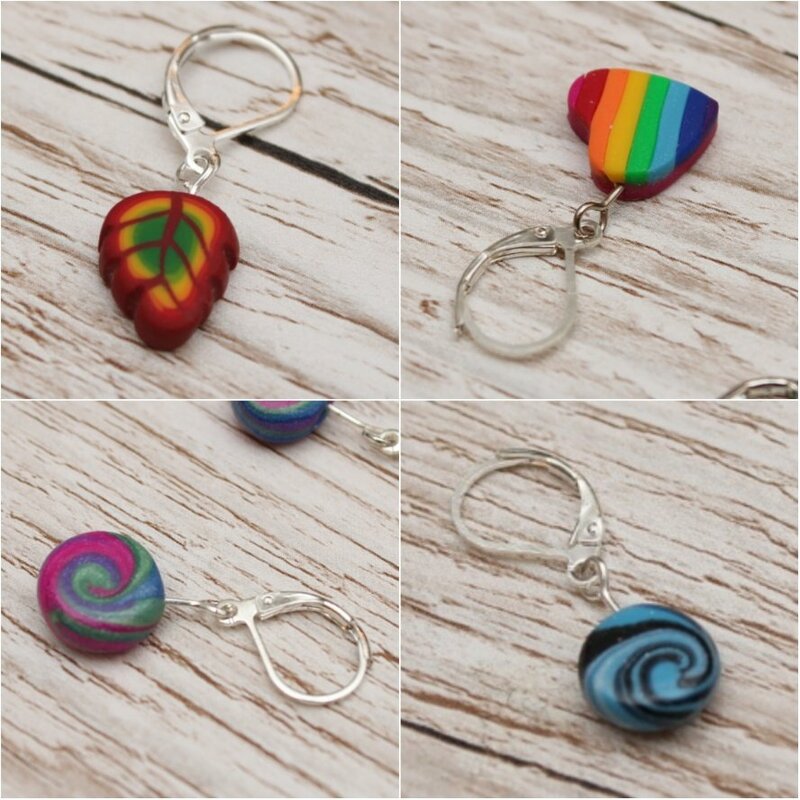 So If you need a project bag, do go over and check out Etsy – she is still quite a small business and I am sure will be very greatful for your visit. I received this yarn and pin badge as a reward from Sealy MacWheely, for helping to fund her dream of opening a Bricks and Mortar store via Kickstarter. 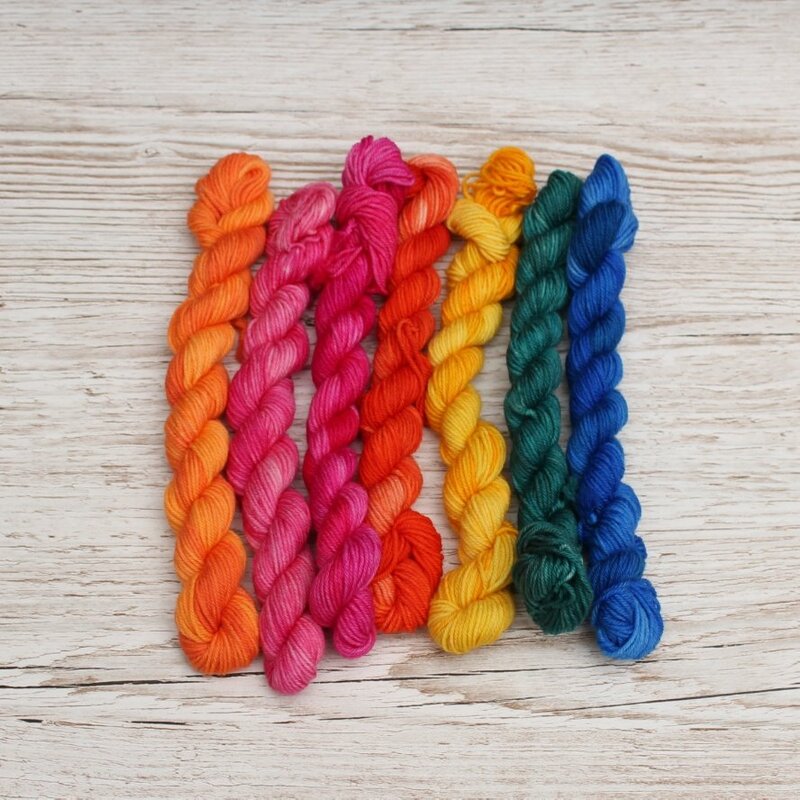 The colourway is a kickstarter exclusive, so you won’t be able to get this specific colourway, but I would definately recommend giving her Instagram a perusing – just don’t blame me if you can’t help but spend all of your money! 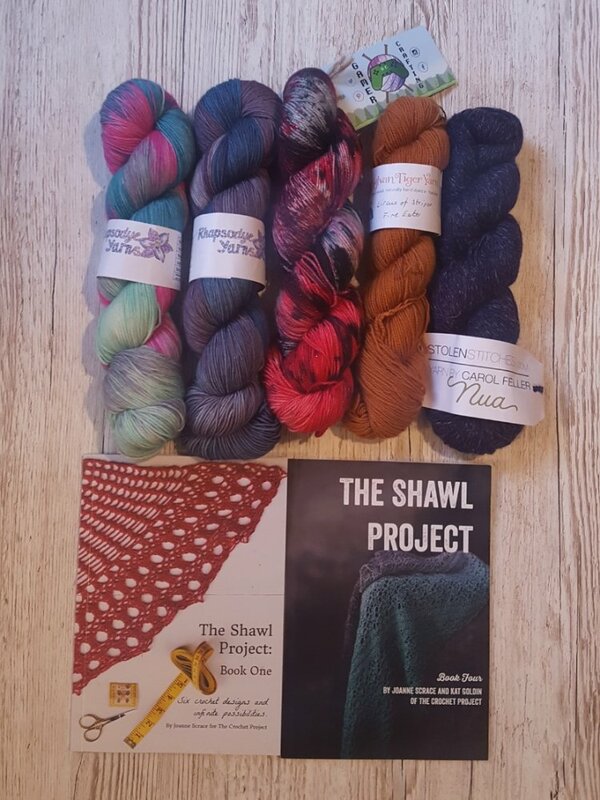 First of all, I want to share with you these yarns we got from Truly Booked in their boxing Day sale. I do have justification though. I wasn’t actually the initial shopper here. My fiance was looking at yarn other which to make socks, and when he asked “do you want anything before I check out” I really can’t be expected to say no, could I. So the yarn in back is mine, and the one infront is my Fiance’s. Can you well we have a favourite colour? I also received another gift from my Fiance for Christmas (I received a steady stream of gifts after Christmas since my Fiance forgot to check delivery times on half of his purchases). Isn’t this the coolest. A marriage of my love’s of crochet and tattoos. And then onto our holiday. In the gap between me finishing my old job and starting my new job, we decided it might be nice to just spend a few days somewhere different, so off we flew to Vienna. And of course, we had to check out the local yarn shops (it is now a tradition after all). We visited 2 yarn shops. The First was Wollewein. 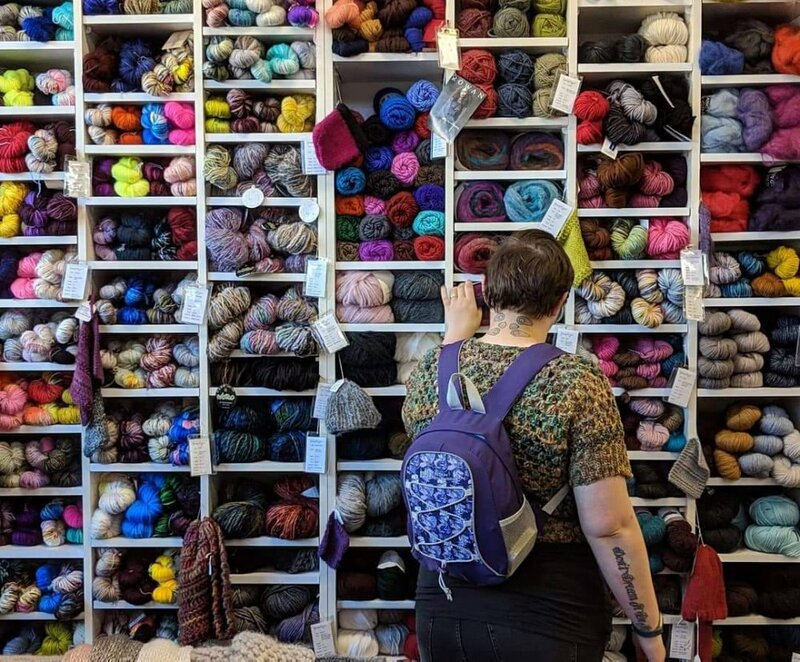 This wonderful little shop has its own line of yarns as well as stocking Fernerwolle, and Austrian yarn brand. You can’t miss this shop if you visit the city center – it’s in the beautiful Greek orthodox church building. Whilst you are there just a few minutes walk away is a wonderful restraint selling hearty Austrian meals in an informal setting – Schachtelwirt. We had the best Roast Pork with Crackling, Dumplings and Sauerkraut so tasty it made me want to learn how to make it at home. Anyways, I digress – again, not all of this yarn is mine. 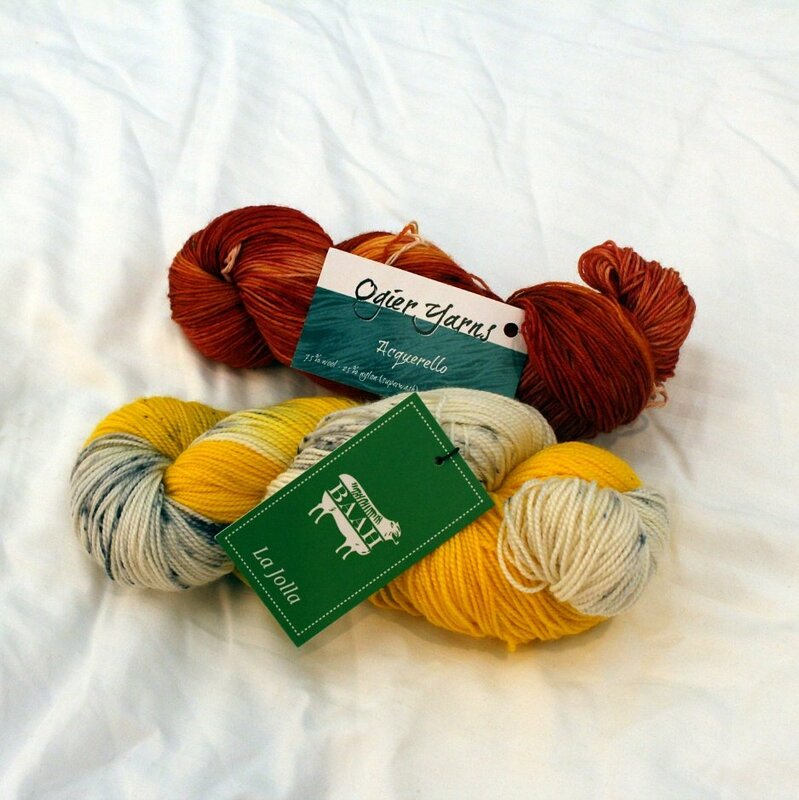 The green and grey yarn is mine – I almost picked a sunset shade but then decided I already have so much yarn in orangey shades that perhaps I ought to try something else. The darker yarn is my Fiance’s. Again with the purple – he liked this one because it apparently works up like a purple tiger. The second shop we visited was Lille Butik GMBH. Very unasuming from the outside, but full of beautiful yarn on the inside. And there was a wonderful little market on the streets adjacent, so if it hadn’t been icy cold and snowing, we could have easily wandered around longer drinking and eating local produce. I got just 1 cake of yarn here. Poema by Laines Du Nord. Italian so not technically local but they do share a land border and I have never seen this yarn before so that totally justifies the purchase. 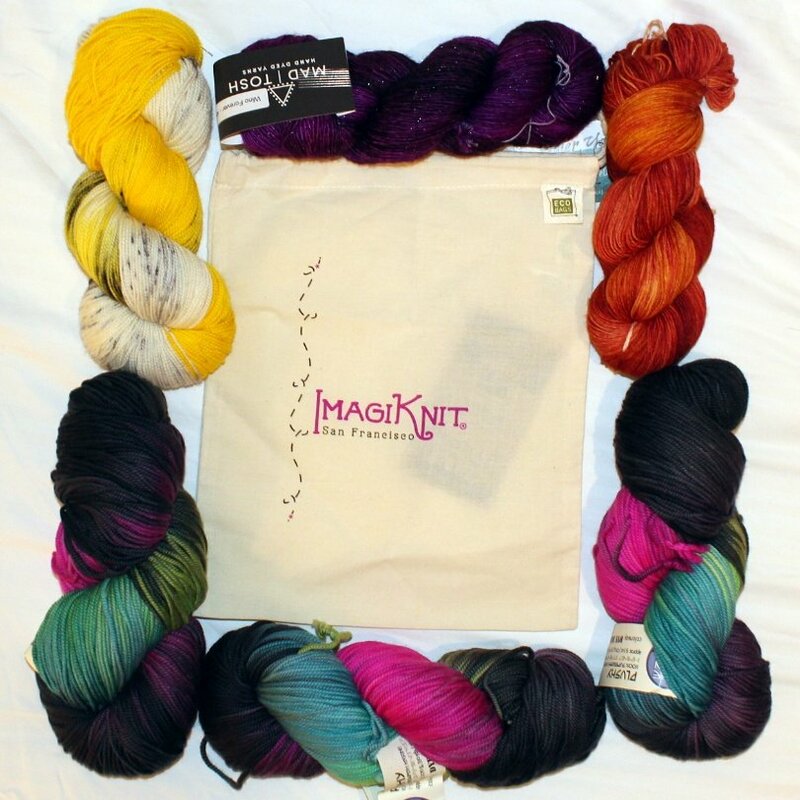 And now to find projects for these lovely yarns. Any ideas? Bonus – of course, max smelt yarn and had to get involved so here are the out takes. 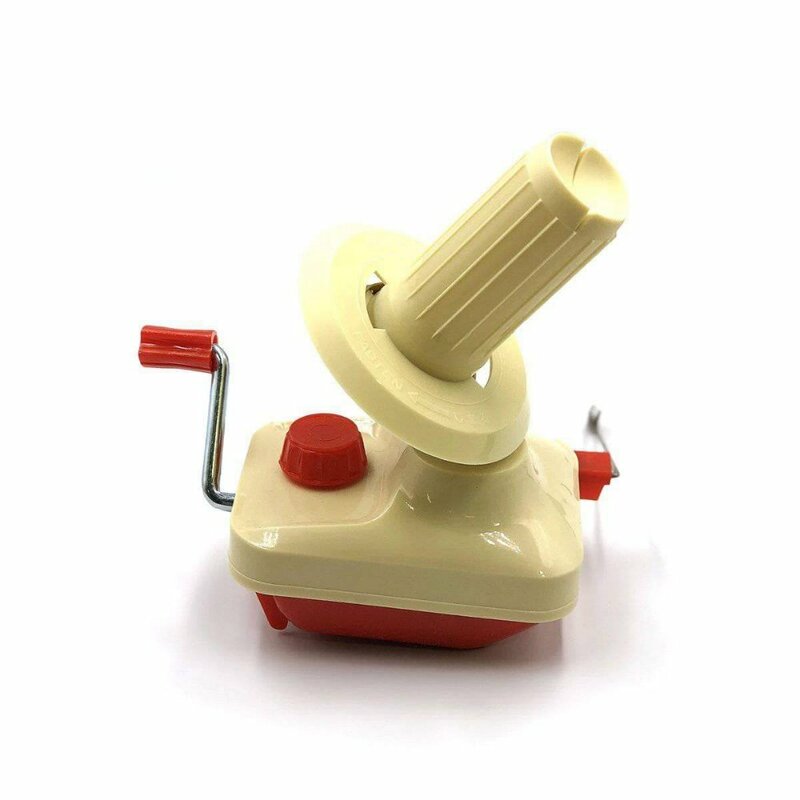 I remember the joy I had when I bought my first ball winder – the happieness that can be acheived from a lovely little cake of yarn is something that is hard to understand if you dont knit or crochet. 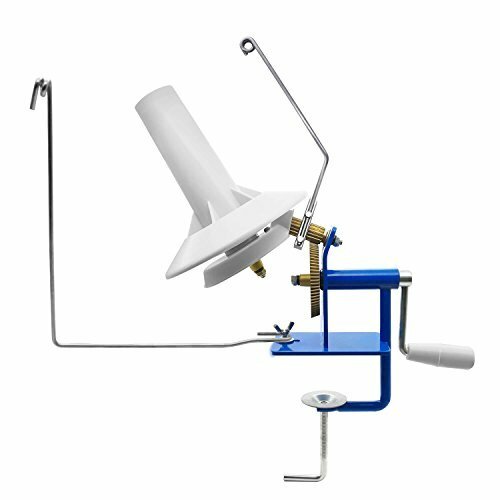 Well, my original ball winder was great, but it is only rated up to 4 Ounces. Which is just over 100g. However, I would argue that it is only really suitable for 50g – at around 80g, the yarn starts to bunch up, with large gaps between lines, and the yarn often slips and gets stuck in the gears. Its for this reason that I am a little scared to wind my expensive hand dyed yarns on it. Well, now that my hand dyed yarn collection is quite large, I decided to use some of my christmas money to purchase a larger more heavy duty. Enter this beast. This winder cost me around £20, and is rated up to 10 Ounces. which is almost 300g! And of course, once it was out of the box, I had to give it a whirl. Out of the maximum security yarn storage box (A special clip lock box that the cat cant get into) came this gorgeous Abstract Cat Superwash Merino in colourway Joie De Vivre. 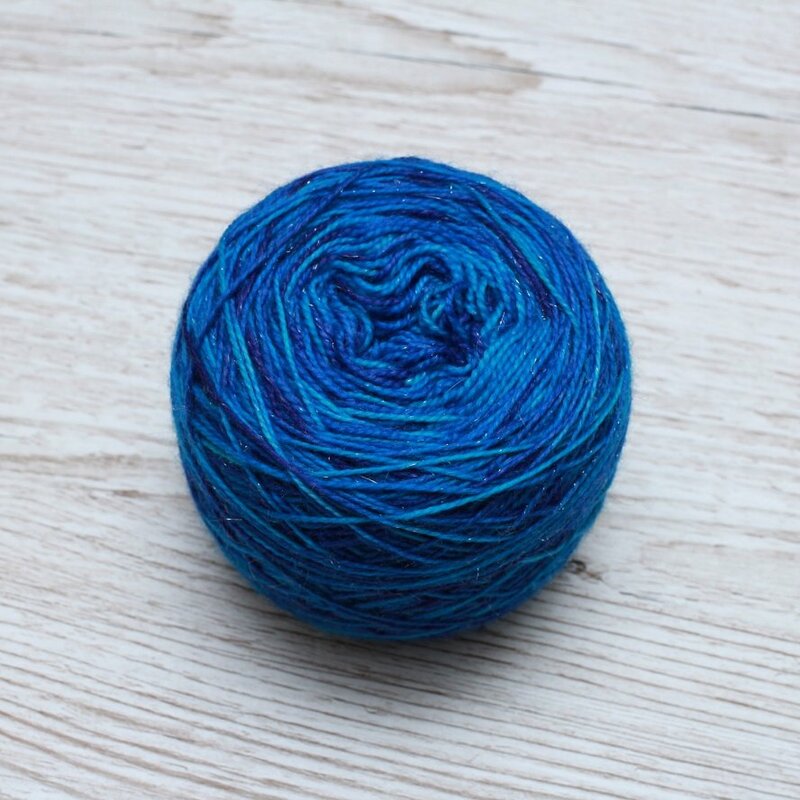 I was given this gorgeous yarn in september of 2017 as the winner of a giveaway that Hannah over at Quiet Water Craft was running as a celebration of reaching 800 followers. I finally found a pattern that I love so I am pleased to say it is finally getting its moment to shine! Isnt the cake beautiful? I was transfixed as I wound it by all the wonderful colours – from the outside of the initial hank, it looked like a beutiful blue varigation, but as you get further into the yarn, there are actually gorgeous shades of purples and aquas too! I cant wait to work it up! Thanks Hannah! I am flying to Vienna tomorrow so this will be my in flight entertainment. Another Advent post. I cant beleve how quickly christmas has come around. The yarns have gotten much brighter! Last weels were along the bluey green and purple end of the spectrum. Rhis week its more on the sunset shade of the spectrum. I love the orange in the middle! 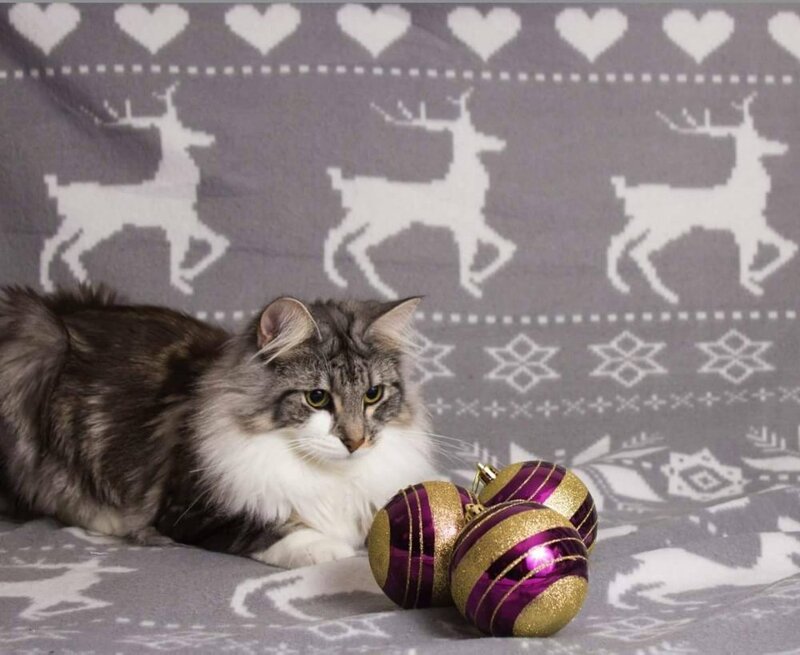 Another week has passed so here I am again to share with you the last week in advent yarn! Its getting brighter! Arent they lovely! I particularly love the purple. 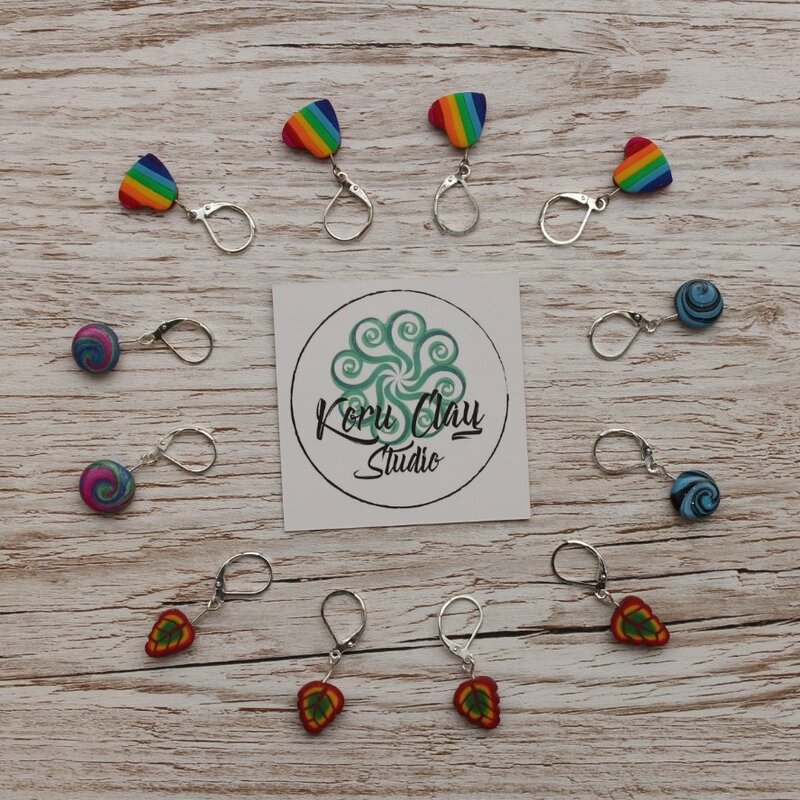 And do you remember last week, one of the lovely extras was a cute little festive stitch marker from Koru Clay Studio and I told you I got a bit carried away on their etsy store! Well my purcheses arrived a few days ago! They are so gorgeous! I especially love the autumnal leafy ones. Heres to seeing what the next week brings! Woooohoooo! Its was my birthday on the 28th and I am lucky enough to be in San Francisco to celebrate. 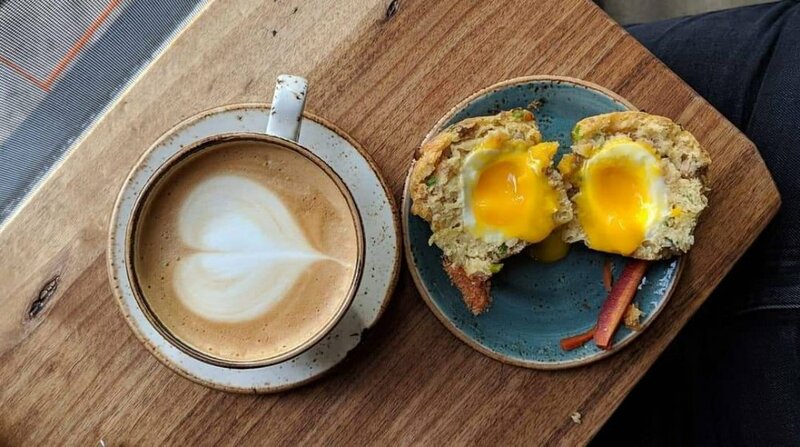 We had a marvelous day, which started with Breakfast at Craftsman and Wolves. 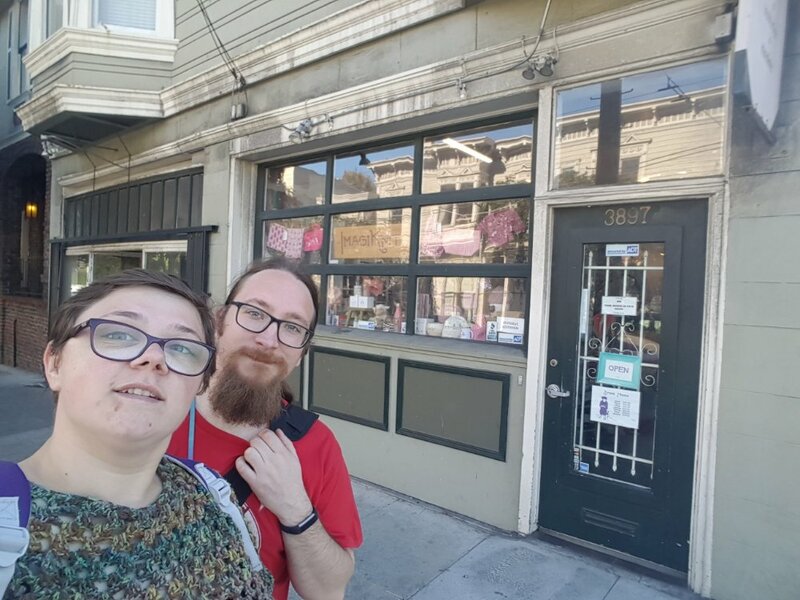 Then after a wander around discovering the street art of the Mission District, we headed for Imagiknits, for the obligatory birthday yarn buying trip. 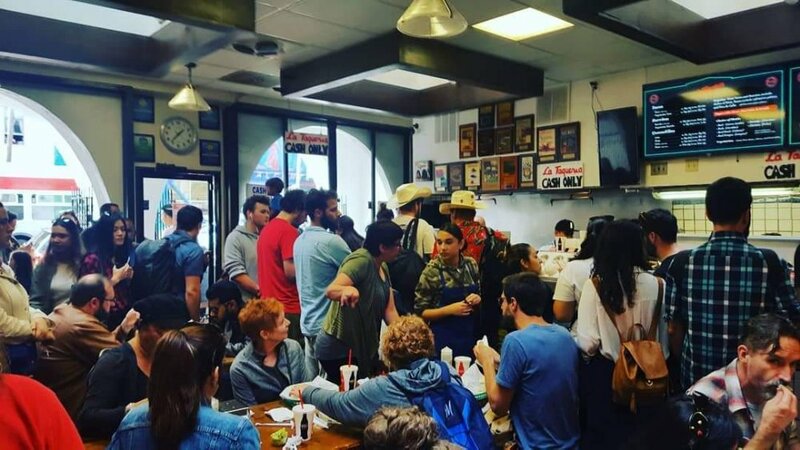 Then after more street art exploration we headed to La Taqueria on 24th street to get burrito’s for lunch – they were good, but what would you expect from the Best Mission Style Burrito joint. Look how busy it was! 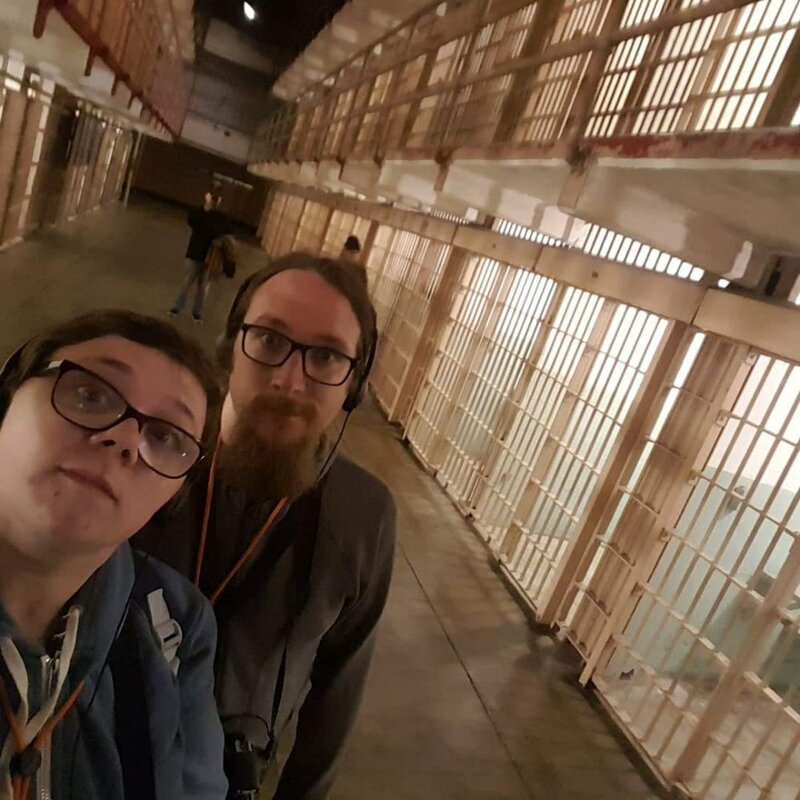 Then we went to Alcatraz! It was awesome – I love crime documentarys and so this was right down my street! 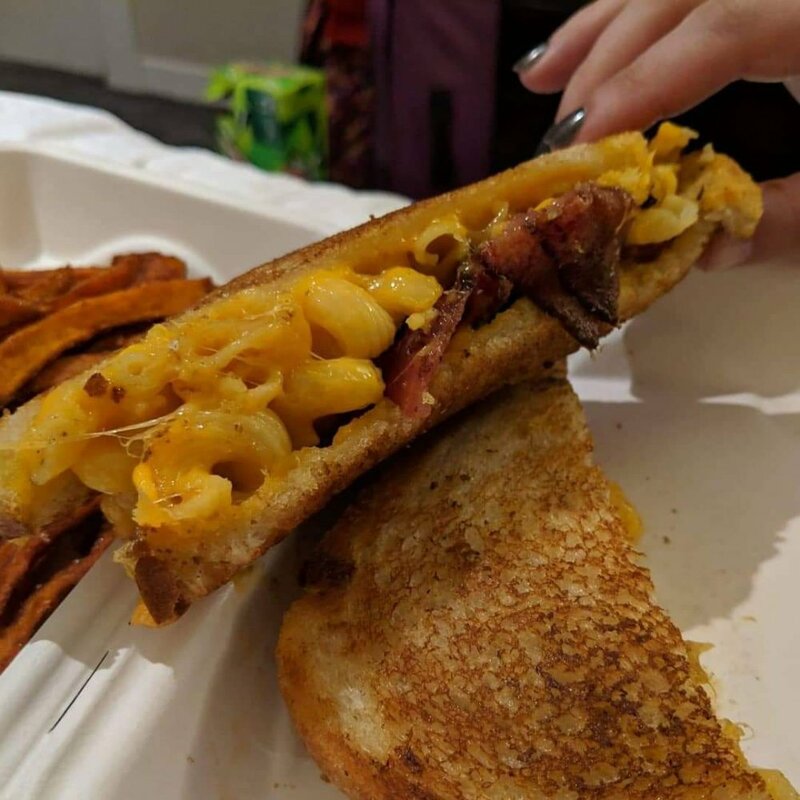 Then we ended the day with Bacon Mac and Cheese Grilled Sandwiches! It was possibly the coolest birthday ever! Anyways, I expect you are here to see which scrummy yarns I purchased. Well here they are. As is holiday tradition, I had to buy some local yarns. So I got 2 Californian Yarns. On top is Acquerello by Ogier Yarns, from Moss Beach California. It is hand dyed in small batches and is 75% Wool 25% Maufactured Fibres. I fell in love with the gorgeous orange shades. Its so autumnal! The other is La Jolla, by BAAH yarns. It is 100% Merino Wool. I absolutely loved this colourway! 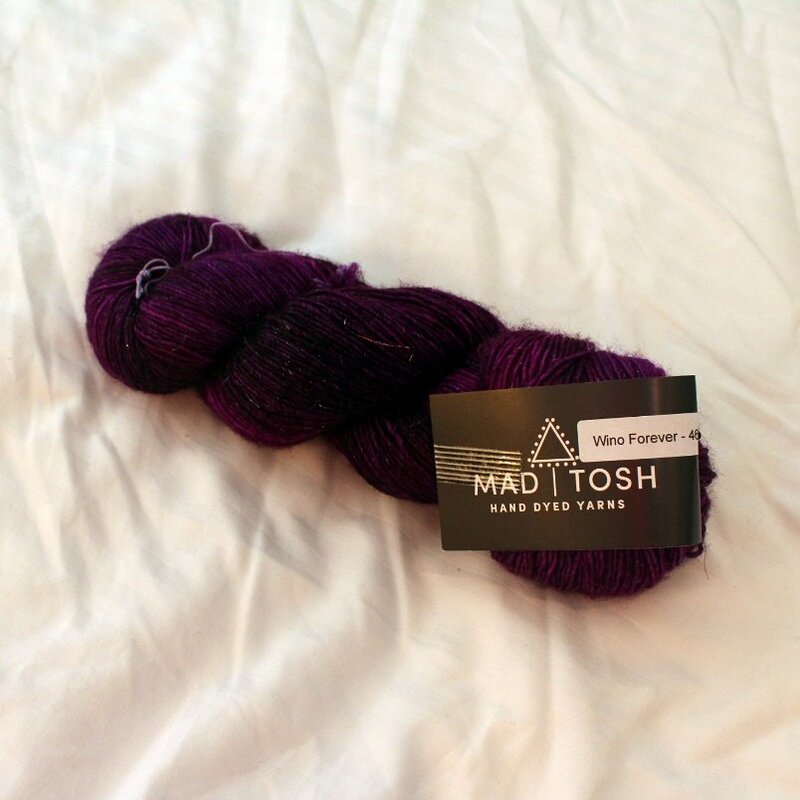 I also purchased some Madtosh Merino Light + Glitter. It is 90% wool, 8% Acrylic and 2% Stellina. 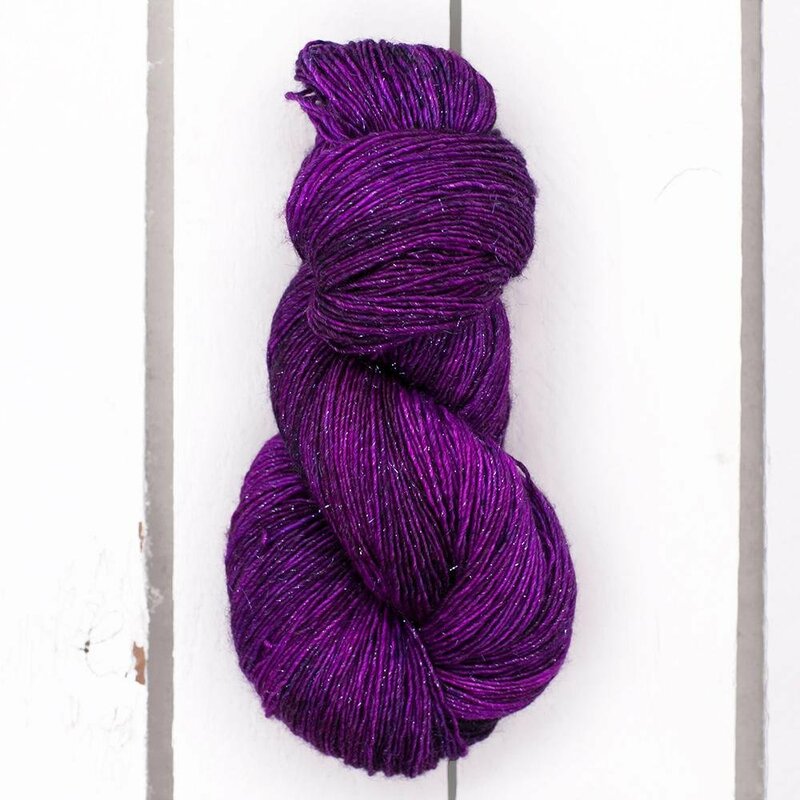 I fell in live with the Wino Forever colourway, but found it a real struggle to pick which weight I wanted it in! In the end it was the sparkleyness of this yarn that won it! Its hard to photograph just how beautiful it is. The sales photi from the website does a much better job! Its like neon purple and its gorgeous! 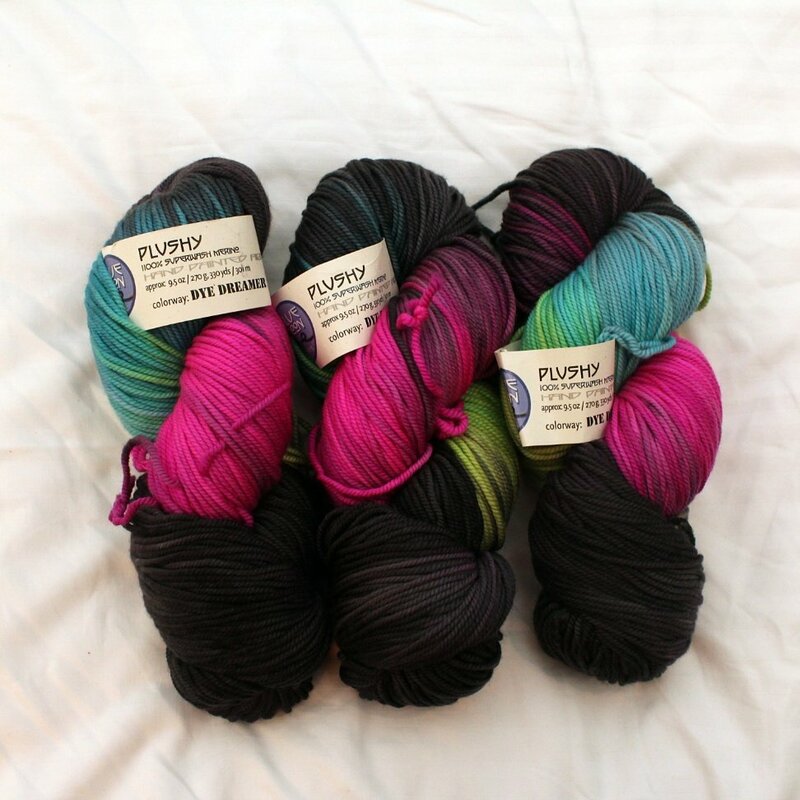 Finally I got 3 skeins of Plushy by Blue Moon Fibre Arts from Oregon (only 1 state over so still fairly local to my trip). 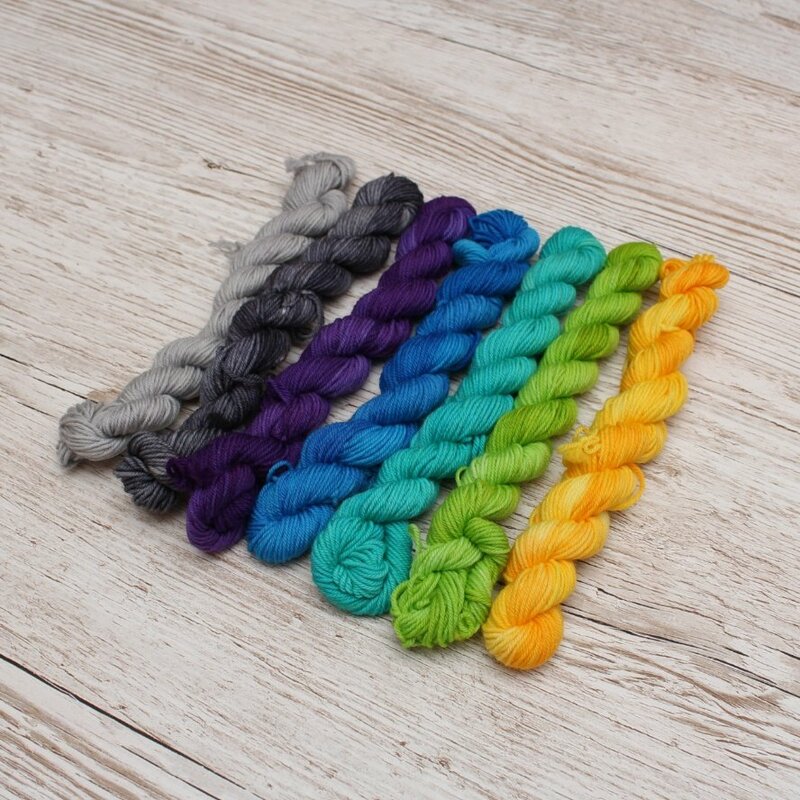 Each skein is 270g so in total I have 810g. I intend to make another Harvest Moon sweater with it.